The global cosmetic bottles packaging market is projected to improve its value to a significant high in the coming years. The buying decision of cosmetic product consumers could be influenced by the technique, material, and design of packaging. Besides marketing cosmetic products, packaging could play a critical role in protecting them from damage during handling or traveling. Cosmetic bottles packaging is foreseen to be one of the important factors considered by industry players to achieve a competitive edge over other manufacturers and keep up with changing trends. The global cosmetic bottles packaging market is forecasted to rise at a CAGR of 5.0% during the forecast timeframe 2017–2022 to touch a revenue valuation of US$8.3 bn by the concluding forecast year. In 2017, the market earned a valuation of US$6.5 bn. The world cosmetic bottles packaging market is envisioned to be segregated according to capacity, material, and application, where each category could incorporate a leading segment creating ample of favorable prospects for players. For instance, as per capacity, the market could see a segmentation into below 50 ml, 50 ml–100 ml, 100 ml–150 ml, 150 ml–200 ml, and above 200 ml. Out of these segments, below 50 ml is prognosticated to bag a king’s share in the market while expanding at a 4.9% CAGR. According to type of material, the world cosmetic bottles packaging market is prophesied to be classified into metal, glass, and plastic. In view of application, the market could be cataloged into skin care, hair care, makeup, and nail care. All of these segments are closely assessed in the report while comparing their revenue, market share, and Y-o-Y growth by region achieved between 2012 and 2022. In terms of geographical segmentation, the international cosmetic bottles packaging market is anticipated to be segregated into different regions and a single country. While there could be little hopes of growth expected from underperforming Japan and the Middle East and Africa (MEA) markets, Asia Pacific except Japan (APEJ) is predicted to garner a higher share by the end of 2022. During the course of the forecast period, APEJ could gain 143 basis points (BPS) in its market share. Europe is prognosticated to reach a noteworthy revenue valuation of US$2.3 bn by 2022 end, presenting itself as a lucrative region for the international cosmetic bottles packaging market. North America could also be of great interest for players looking for opportunities in the market. It could grow at a higher CAGR of 5.0% than that of Europe. Latin America is expected to be another segment important to keep an eye on when operating in the market. The worldwide cosmetic bottles packaging market could experience the presence of top players such as Aptar Group, Inc., RPC Group PLC, Gerresheimer AG, Amcor Ltd., Albea Beauty Holdings S.A., Rebhan FPS Kunststoff Verpackungen GmbH, HK Cosmetic Packaging GmbH, Silgan Holdings, Inc., Quadpack Industries S.A., and Witoplast Kisielinscy Spólka Jawna. The global cosmetic bottles packaging market is envisaged to testify a considerable growth due to growing consumer preference and its massive growth potential. This could be on account of the flurry of various types of material and packaging used across a range of applications. Packaging is looked upon as a vital element to boost sales as companies improvise and improve it for enhancing the esthetic appearance of their products. With a view to maintain their competitiveness in the market, packaging firms could take to technological developments, new designs, and other innovations. This publication could be a comprehensive and thorough guideline for players wanting to secure a dominating position in the global cosmetic bottles packaging market. Several factors such as trends and opportunities and competitive scenario are evaluated by the authors. The world cosmetic bottles packaging market is prophesied to gain impetus in the near future due to the elevating demand for cosmetic products and the speedily progressing cosmetic industry. The cosmetic industry is studied to increase its growth due to rising concerns about facial appearance and beauty consciousness. The swelling size of aging population could be another factor propelling the growth of the industry. The demand for cosmetic packaging is projected to be metabolized by the surging demand for luxurious products. The soaring number of concerns about cosmetic packaging among consumers has provoked various regulations in different parts of the world. This has promoted an increasing count of innovations to take shape in the world cosmetic bottles packaging market at a high pace. Plastic packaging could secure most of the demand in the next few years. The international cosmetic bottles packaging market is predicted to see a classification according to type of capacity, where significant segments could be below 50 ml, 50 ml–100 ml, 100 ml–150 ml, 150 ml–200 ml, and above 200 ml. Among these, below 50 ml could hold a larger revenue share in the market. In 2017, this segment earned a US$2.0 bn. In terms of type of material, the market is anticipated to be segmented into plastic, glass, and metal. On the basis of application, there could be critical markets for cosmetic bottles packaging such as skin care, hair care, makeup, and nail care. 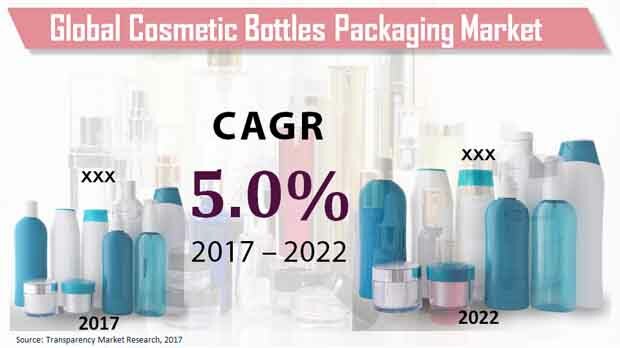 With respect to region, the international cosmetic bottles packaging market is foreseen to be dominated by Asia Pacific except Japan (APEJ), which is prognosticated to rise at a 5.9% CAGR. The Middle East and Africa (MEA) and Japan could showcase a sluggish growth in the coming years. However, there could be opportunities in other regions such as Europe, North America, and Latin America. The worldwide cosmetic bottles packaging market is foretold to witness the presence of leading firms such as Aptar Group, Inc., RPC Group PLC, Gerresheimer AG, Amcor Ltd., Albea Beauty Holdings S.A., Rebhan FPS Kunststoff Verpackungen GmbH, HK Cosmetic Packaging GmbH, Silgan Holdings, Inc., Quadpack Industries S.A., and Witoplast Kisielinscy Spólka Jawna.